Note: While this post discusses impediments in VSTS, everything mentioned can be applied to TFS as well. 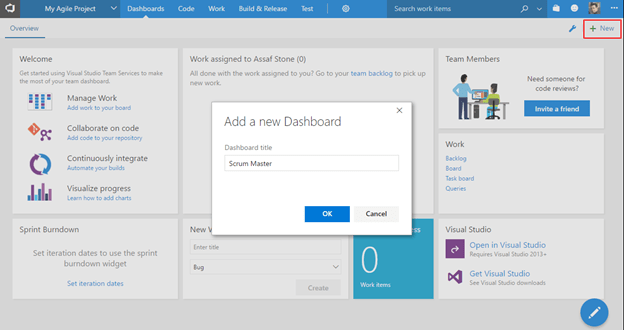 Visual Studio Team Services (or VSTS) has great tools to support Scrum teams. The product owner can use the backlog and board to track the progress of individual teams or the entire product, at the Product Backlog Item (PBI) level, at the Feature level or even the Epic level, throughout the entire lifetime of the product. 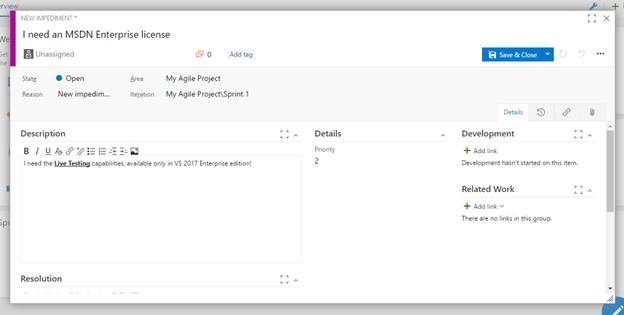 The developers can track the progress that they are making within the sprint, and see how their work (tasks) fit into the larger picture, by associating them with the PBIs that make up the product. But what about the Scrum Masters? What tools do they have in VSTS to help them track their work and their progress? According to Scrum.org’s official Scrum guide, one of the services that a Scrum Master provides to the development team, is the removal of impediments to the team’s progress. An impediment is anything that causes a developer to be unable to make progress towards completing the sprint’s goal. Whenever a developer has a problem that cannot be solved within the scope of the team, it is the Scrum Master’s responsibility to remove it. 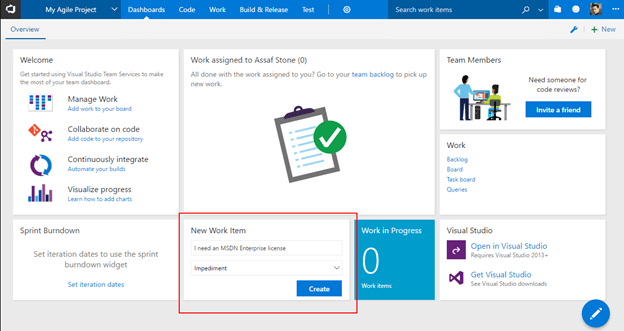 Visual Studio Team Services has a work item type dedicated towards tracking impediments, and progress on their removal. For projects using the Scrum Template, this work item type is called an impediment. For projects using the Agile or CMMI templates, this is called an Issue. Regardless of template, they both serve the same purpose: They mention a problem, and their state machine tracks the progress. 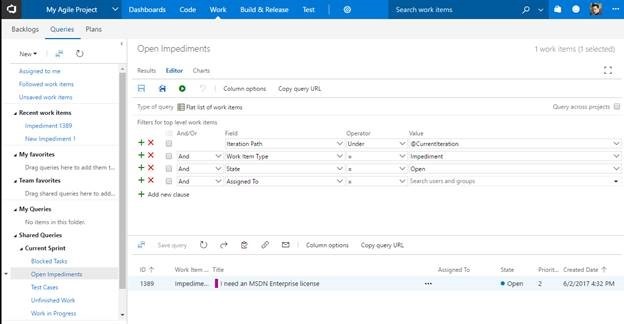 Unfortunately, impediments and issues do not show up in VSTS’ backlogs or boards. Those are designed for tracking progress on the delivery of the product, and the Impediment work item type is not included. That said, how should a Scrum Master and the Scrum team track these impediments, especially in large distributed projects, where face-to-face communication and jotting a note on a pad is not a viable solution? The first step to being able to track impediments in VSTS is obviously to enter the impediments into VSTS. The best way to guarantee that impediments do, in fact, get logged in VSTS, is to make it quick and easy to do so. I suggest using widgets in the Work Dashboard. This should be located prominently in whichever dashboard all the Scrum team members view regularly. Finally, just click Save & Close, or press Ctrl+Enter to save and exit the work item. As a Scrum Master, I will want to keep track of all the impediments in the team. I will want to note new impediments that are not assigned to anyone for removal, and I will want to keep track of those assigned to me (if there is more than one Scrum Master in the project, which may occur in large projects). In order to set up your impediments query, you will need to go to the Work | Queries submenu. At this point you have two options. You can customize the existing Open Impediments (or Open Issues, in the other templates) query, which you will find in the Shared Queries section, under the Current Iteration folder, and customize it, or you can create a new query. If you choose to create a new one, just be sure to save it as a shared query, so that you may use it later with some widgets. Having a query that shows the list of open impediments is important, but the information must not only exist and be available, it also needs to be accessible. In Scrum parlance, we call this Information Radiation. In this step, we will make sure that this information is in the face of the Scrum Master. You will now have an empty dashboard that you may fill with widgets. We will use the space to add widgets that help us track impediments. The ‘Add Widget’ sidebar will open (you can also click on the edit button, and then the + button at the bottom right to open it. You may now add widgets. · Display Columns: Choose the columns that you wish to display. I would make sure to have the Title, State, and ‘Assigned To’ columns. If you can set this up on a monitor that is always on display in a team’s room, this can be a very powerful tool for Scrum Masters. 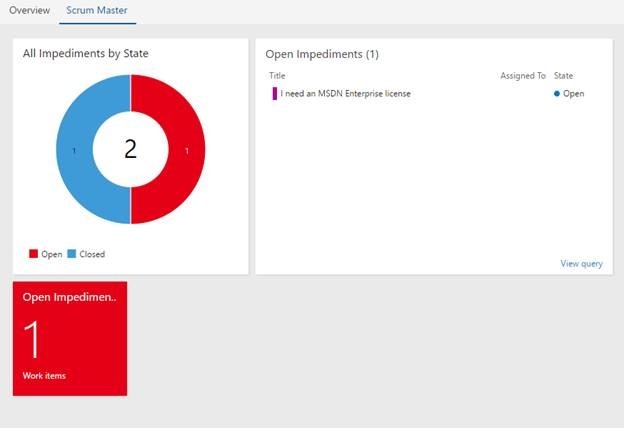 What other queries and widgets would you suggest for the Scrum Master’s dashboard? Let me know in the comments’ section. This entry was posted in Agile, How To, Productivity, Scrum, VSTS and tagged Agile, Impediments, Scrum, Scrum Master, TFS, VSTS. Bookmark the permalink.